How’s that for a great slogan? The latest mega-scientific report confirms what we already know: That global warming is real, it’s not going away anytime soon, and it is definitely man-made. A panel of international scientists predicted Friday that global warming will continue for centuries no matter how much people control pollution, in a bleak report that blamed humans for killer heat waves, devastating droughts and stronger storms. The report said people were "very likely" the cause of global warming - the strongest conclusion to date - and placed the burden on governments to take action. So Al Gore was right all along. But then we already knew that anyway. The latest National Intelligence Estimate paints a most dismal picture of the situation in Iraq. It’s no wonder the Bush administration has kept the report underwraps until after the mid-term elections - not that it helped them any. Iraqi-on-Iraqi violence has become the primary source of conflict in the war-ravaged nation and Iraqi leaders will be "hard-pressed to achieve sustained political reconciliation" in the next 18 months, according to a summary of the National Intelligence Estimate released Friday. The only reason they are not calling it a Civil War is because that term is apparently too simplistic to describe the free-for-all shoot-em-up that we are caught in the middle of. The summary said that "civil war" is too simple a moniker to describe the situation because the violence includes "extensive Shia-on-Shia violence, al Qaeda [in Iraq] and Sunni insurgent attacks on coalition forces and widespread criminally motivated violence." Taking U.S. forces out of Iraq is not an option, the report said, noting that "rapid withdrawal" of troops "would lead to further deterioration." The summary said that such a withdrawal would cripple the Iraqi army, intensify Sunni resistance, perpetuate the creation of an al Qaeda state in Anbar province, west of Baghdad, and stoke overall violence. That’s the definition of a quagmire, isn’t it? We are stuck in a rotten situation and can’t get out? The whole reason we went over there was to stabilize a major oil producing region. (WMDs and 9/11 was just the cover story - total B.S.) And now that effort has collapsed and now we have a situation that would be 10 times worse than if we had just left Saddam in charge of everything. Personally, I think we have no choice but to pull out anyway. I don’t believe things are going to get better the longer we stay. The only question is will they get worse slowly over time, or get worse very rapidly when we pull out. Either way I think the country is going to have to hit bottom before it can start to bounce back. My sister-in-law sent me this link to a post at Daily Kos that gives a good summary of how we were duped into launching the Iraq debacle. I don’t usually link to articles that come across this shrill, but in this case I have to make an exception. As shrill as it may sound, it is the truth. The way the Bush administration connived to steer us into this war is nothing short of criminal and the article linked above gives a good explanation of how it was done. This is how I will always remember Molly Ivins. It’s the picture they used for her Fort Worth Star Telegram columns when I was in college. I thought she was pretty cute. It seems like she went pretty fast, but she had been battling breast cancer since 1999 and put up a heck of a good fight. I can’t believe we’ve lost Ann Richards and Molly so close together. There is a huge void on the Texas Left today that I hope will be quickly filled. The Texas Observer has a nice tribute to Molly, as you would expect. The obit in the Washington Post was written by former San Antonio Express-Newsman Joe Holley. And here is the version from the A.P. In her final column she threw down the guantlet on getting our troops out of harm’s way in Iraq. Paul Krugman had an excellent tribute to Molly Ivins in the NYTimes today. "...obituaries that mostly stressed her satirical gifts missed the main point. Yes, she liked to poke fun at the powerful, and was very good at it. But her satire was only the means to an end: holding the powerful accountable. So Molly Ivins — who didn’t mingle with the great and famous, didn’t have sources high in the administration, and never claimed special expertise on national security or the Middle East — got almost everything right. Meanwhile, how did those who did have all those credentials do? With very few exceptions, they got everything wrong. They bought the obviously cooked case for war — or found their own reasons to endorse the invasion. They didn’t see the folly of the venture, which was almost as obvious in prospect as it is with the benefit of hindsight. And they took years to realize that everything we were being told about progress in Iraq was a lie. Was Molly smarter than all the experts? No, she was just braver. The administration’s exploitation of 9/11 created an environment in which it took a lot of courage to see and say the obvious. Molly had that courage; not enough others can say the same. And it’s not over. Many of those who failed the big test in 2002 and 2003 are now making excuses for the “surge.” Meanwhile, the same techniques of allegation and innuendo that were used to promote war with Iraq are being used to ratchet up tensions with Iran. Now, more than ever, we need people who will stand up against the follies and lies of the powerful. 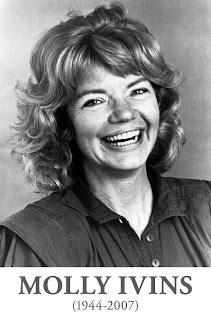 And Molly Ivins, who devoted her life to questioning authority, will be sorely missed."